I guess Microsoft has been busy the last week. Not only is Virtual Earth 3D now up to version 1.1, MapCruncher 3.0 has also been released. Rather than list all the changes in 3.0, you can view the changelog yourself here. The biggest change that addresses some of the issues I had is transparency. And of course it now supports VE 3D so I can’t imagine how cool these mashups are going to be now with 3D support. I wish I wasn’t heading out for the day so I can play with MapCruncher. If you don’t feel like creating your own mashups, you can view some in the MapCruncher demo gallery. Non appear to be 3D, but I’m sure that will change by next week. 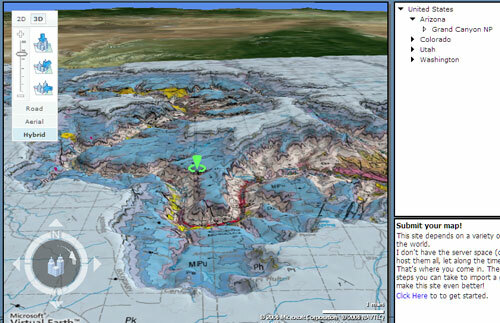 Until then check out this interesting MapCruncher site called 3D Geology Maps.